Earlier this year at eComm 2009, I gave my “lightning talk”. At the end of the day, I have to accept that I did a terrible job. An eComm “Lightning Talk” is a 5-minute presentation. My problem was, I really just condensed a 15 minute talk down to five minutes. While I did cut out a lot from the larger talk, I didn’t focus the presentation enough. I practiced and practiced the talk and successfully completed the presentation in five-minutes, but it tried to present too much information across too many directions. What we care about with intention based economics is human psychology and behaviour, both individual and in aggregate. … what we need to build for is access to ever more personal information, i.e. about the human behind the endpoint. Privacy does not exist looking long-term. Ever more personal information is the new currency, which underlies intention-based economics, and people will increasingly trade it for free access to services. … telecom networks receive vastly more human attention coming in from the edges and transit much more “intention data” than Google, in the form of telecom signaling. But it’s latent, not acted upon and thrown away. They actually throw away their most precious asset and plan to continue charging for their long-term least worthy asset (voice transmission). This research looked at “intention data”. Instead of throwing away this telecom signaling information, as the telecom companies currently do, this research used the data to study actions of the “human behind the endpoint” to include historical analysis as well as making predictions, i.e. determining intent. The signaling data of who is talking to who, combined with their locations, recent movements, and so on, can be used to predict future actions (intent). For example, a certain flurry of a certain kind of activity might suggest that a group of friends are probably going to go see a movie together. Advertisers would be interested in such fore-knowledge, one would think. I think it’s particularly interesting that we were able to do this in the real world, using real phones available today, and doing so without the user’s active involvement and without the permission or participation of the carrier, i.e. as an independent third-party with no special relationship to the carrier. 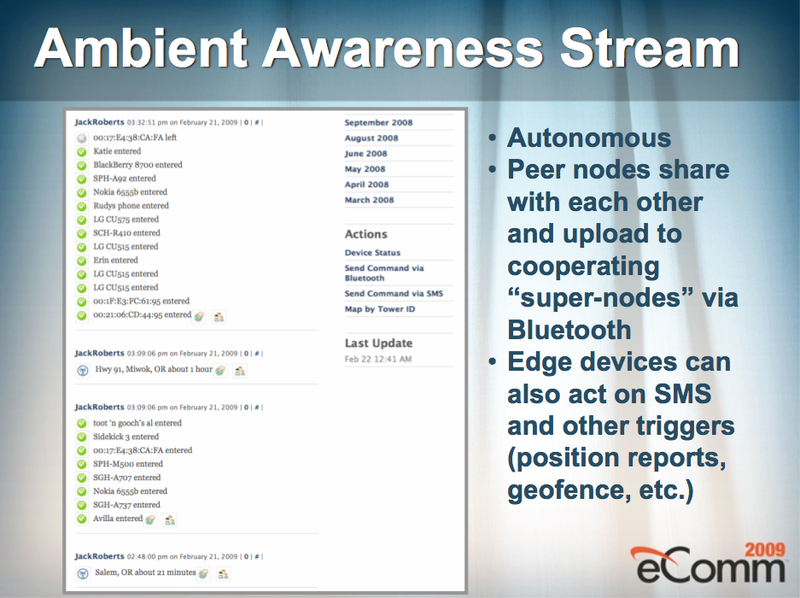 We did it by supplying users with modified edge-devices (phones) that provided “ambient awareness” streams. 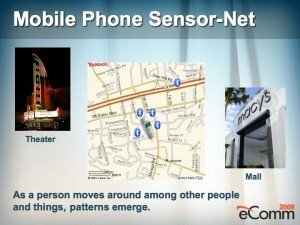 These phones didn’t require GPS – we used cell tower and bluetooth proximity for location data. We didn’t need a very large sample to get meaningful results. Everything we did in this research could be done by the carriers and of course they may be doing it already and we wouldn’t know. This research shows how practical intention-based economics is and that it may not be as far off or as abstract as we think. This research basically turned humans into “sensors” emitting data about their location and, more importantly, who they are talking to (and texting with), all as a surreptitious side-effect of carrying around a mobile phone and performing their every day routines. In general, besides location, other behaviors are very powerful indicators (behaviors like “what are they taking pictures of?”). A single data point may not provide much insight, but when viewed over time, and in relation to other human actions and behaviors, it becomes incredibly powerful. With this power comes responsibility. As Lee says “Privacy does not exist looking long-term.” This research doesn’t attempt to answer that question. Rather, it explicitly intends to raise awareness that it must be addressed and, given the results we were able to obtain in this research in fairly short time and with relatively modest resources, it needs to be considered sooner rather than later.